Lamborghini, on the strength of its active aerodynamic system, has received the prestigious Innovation Award from the U.K.'s Autocar magazine. In the last couple of years, Lamborghini’s Huracan has won many awards for its design and performance. A subsidiary of the Volkswagen Group, the stylish limited-edition supercar, the Huracan clings to any road surface as if there were glue on the wheels, while also delivering blistering 200-plus mph driving performance. Typical performance for the Huracan is 2.3 seconds to hit 60 from a standing start and a high end that’s in the 213-mph realm. Last weekend, the Huracan received a prestigious award from the U.K.’s top automotive publication, Autocar. The award coincided with the vehicle’s weeklong dynamic launch. Lamborghini received the honor at an appropriate location, Britain’s veteran motor racing venue, the track at Silverstone. At Silverstone, Maurizio Reggiani, Lamborghini’s board member for research and development, received the prestigious Innovation Award from the U.K.’s prestigious automotive publication Autocar. Tisshaw and other editors took the wheel of the high-performance machine during its launch to verify that the “active aerodynamic system takes dynamic handling to a new level.” Their time behind the wheel confirmed their earlier impressions. Tisshaw enthused that the publication’s review panel “can also vouch for the remarkable performance of this naturally aspirated” supercar. 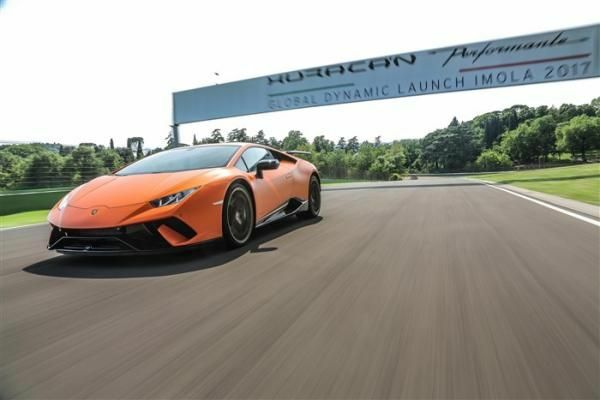 He said that the Huracan’s performance capabilities have already been proven by the lap record a production copy of the Huracan Performante set on the Nurburgring’s “North Loop,” one of the most demanding circuits in racing. The challenging 14-mile loop includes not only some hard cornering, but it also includes a massive drop as the road surface descends through “the Woods.” Reggiani concluded his remarks by noting the award provides additional acknowledgment of the Huracan’s handling prowess. The handling package, Lamborghini’s patented Aerodinamica Lamborghini Attiva (active aerodynamics) also verifies the “talent of our R&D and design team,” he concluded.